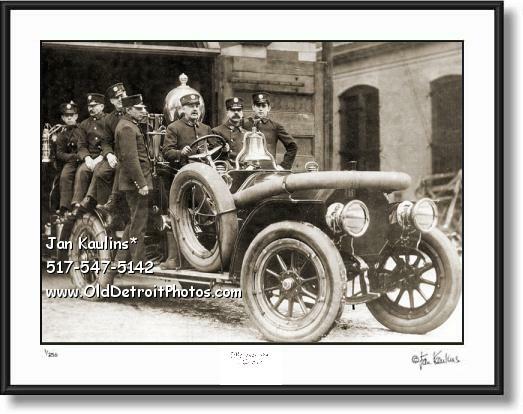 VINTAGE OLD DETROIT FIRE DEPARTMENT ENGINE photo print picture for sale. This sepia toned black and white old Detroit Fire Department Detroit old Fire Engine photo print picture for sale is made from the restored original black and white (ca. 1920's) black and white vintage Detroit Fire Department photograph of the first autombile in the Detroit Fire Department, Eng. 3. It shows The Detroit Firemen proudly posed in their newly acquired fire fighting vehicle, which was soon to entirely replace the horses that had been used from the 1860's up until then. This is an excellent and rare image of this vehicle and the Detroit Firemen.